Fear and ignorance keeps patrons from enjoying the work of young black artists in the South African slum of Diepsloot. Life is hard in this shantytown of 160,000 on the northern edge of Johannesburg, where unemployment runs over 50%. But life is also exuberantly creative, with a rich feast of theatre, hip-hop, music, poetry, story-telling and visual arts on offer. The 2009 film Diep Salute provides a glimpse of the energy of Diepsloot artists, suggesting a host of tantalizing possibilities for arts markets and for community development. 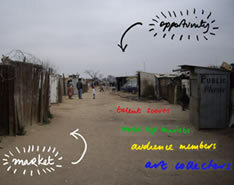 Global Studio brought artists together for the Diepsloot Arts in Action Festival in 2008, curated by Australian Genevieve Blanchett. This event led to the organization of the not-for-profit Diepsloot Arts and Culture Network (DACN). Now, using a concept based on the Sydney Festival’s successful bussing program, ApexArt could start a revolution in the South African urban arts scene providing much needed publicity, job creation and new markets for Diepsloot. The concept is simple: bring Diepsloot artists to Johannesburg audiences to create awareness and then bring groups of patrons back to Diepsloot. Step 1: Take Diep Salute and the Day in the Life exhibition by Diepsloot photographers to a city gallery, school, theatre and mall, in collaboration with the Johannesburg Arts and Culture Directorate. Step 2: Bus audiences from city locations to the shantytown to experience Diepsloot art and performances hosted by DACN.